We are big fans of banana and sweet potato pancakes, but sometimes it’s nice just to have the old fashioned kind! This simple scotch pancakes recipe is dead easy, using ingredients you should already have in your cupboard/fridge. They are super delicious and nice and soft for baby. These will also be great for when Pancake Day comes on March 1st. 1. Crack an egg in a bowl and whisk until frothy. 3. Add the egg to the flour, then pour in the milk slowly, whisking to create a batter. 4. Add any fruit (optional) we used blueberries. 5. Heat some oil in a saucepan on high heat, once melted, reduce the heat to medium. 6. Use half a ladle of batter for each pancake. Once the edges brown, carefully lift using a spatula and flip. 7. Stack them up whilst you make the rest. Dex ate two of these pancakes easily. 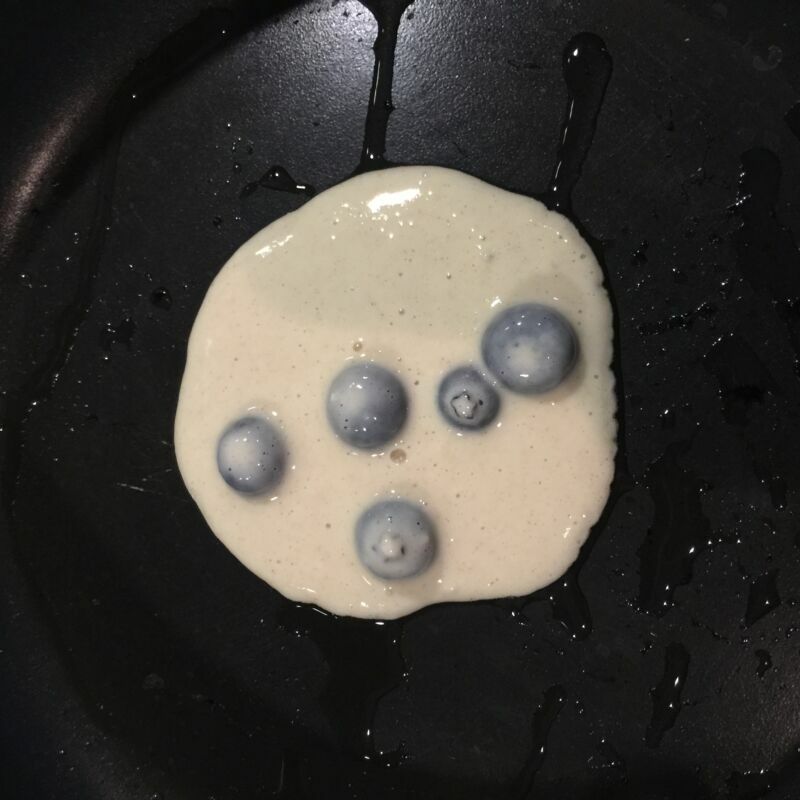 I will warn you, the blueberries created a huge mess. He had a bath afterwards but I couldn’t clean the purple stains off his fingernails! Other fruit you can try are strawberries, raspberries, blackberries, soft cooked apple or you could try dried fruit or even savoury items like prawns or chicken! This recipe is really versatile. The world is your oyster. Let me know if you try these simple scotch pancakes and what you think. Oooh yum! We used to have plain scotch pancakes all the time growing up, I’ve never thought of giving them as a weaning food! Also, who knew blueberries were so messy – everything is always purple stained in our house too! !